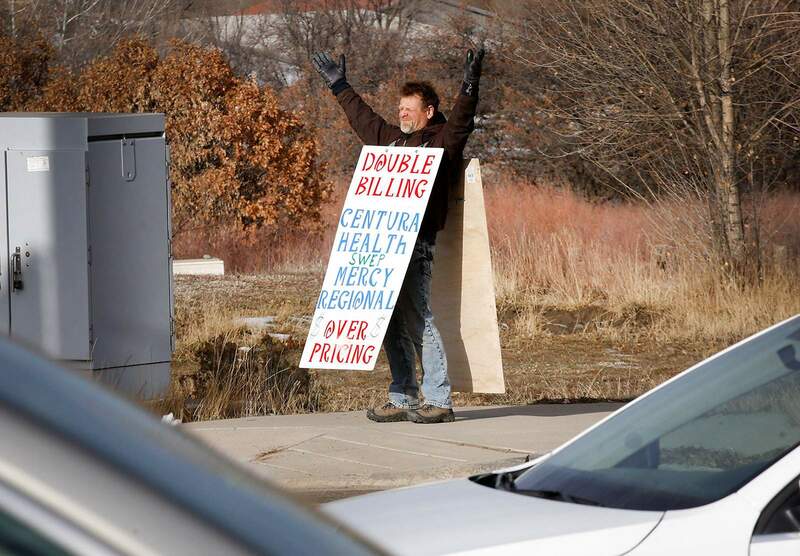 Jeffery “Jot” Stephens protests Centura Health and Mercy Regional Medical Center last month at the intersection of Three Springs and U.S. Highway 160 because he was upset over an emergency room bill. Stephens said he went to the ER to have something removed from his eye, possibly a piece of metal, but he would have saved hundreds of dollars by going to an urgent care clinic. 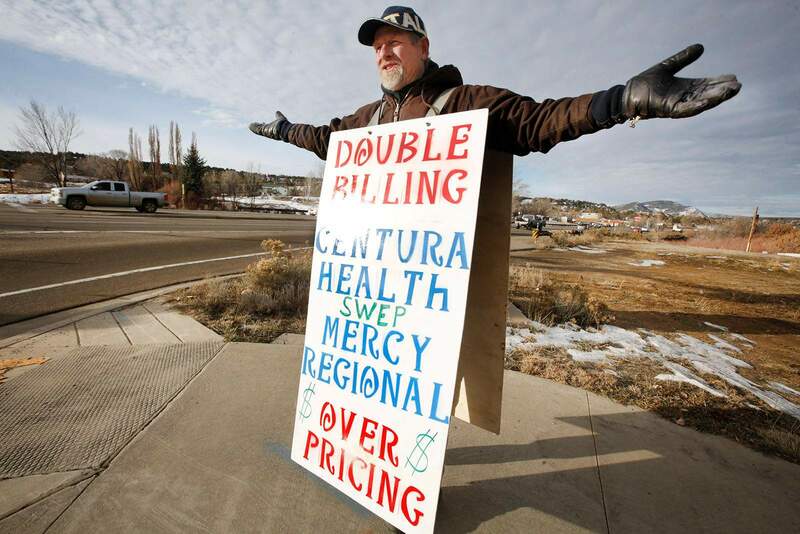 Jeffery “Jot” Stephens protests Centura Health and Mercy Regional Medical Center recently at the intersection of Three Springs and U.S. Highway 160 because he felt wronged by an emergency room bill. Jeffery Stephens was in excruciating pain when he went to the emergency room at Mercy Regional Medical Center in May to have a speck of what may have been metal taken out of his eye. Now, he deeply regrets the visit after receiving nearly $3,000 in legal and medical bills. “Even though people would look at a couple grand and say: ‘That’s nothing.’ I don’t get paid that much money,” said Stephens, a fabricator and mechanic who lives in a school bus. In retrospect, he said he wishes he had gone to an urgent care clinic because it could have saved him hundreds of dollars and prevented a hearing at La Plata County Court over bills he cannot afford. Emergency room care is the highest-priced care a patient can receive, and if a patient has a minor condition and can pause to consider other options for care, such as an urgent care clinic, it could mean major savings, said Joe Hanel, a spokesman with the Colorado Health Institute. About 40 percent of the emergency room visits in Colorado during 2015 were avoidable, according to a study by the Center for Improving Value in Health Care, a Denver-based nonprofit that promotes alternative health care payment models. Avoiding unneeded ER visits could result in $800 million annual savings for commercial insurance companies and their customers, said Cari Frank, a spokeswoman for the center. Emergency room visits are expensive because hospitals must cover the cost of keeping a high-tech facility running 24/7 with trained emergency medical physicians on staff, Hanel said. However, patients are not always able to think through cost-effective options or clinics may be closed, Hanel said. “In an urgent or emergency situation, people are going to do what needs to be done to take care of the immediate injury or sickness,” he said. Bayfield resident Nick Carico faced circumstances similar to Stephens when he got dust in his eye that scratched his cornea 13 months ago. After hours of “ridiculous discomfort and pain,” he went to the emergency room at Mercy but was informed by a hospital employee he should go somewhere else for less expensive care, he said. His treatment was $150 at Durango Urgent Care, said Carico, an acquaintance of Stephens. The Durango Herald obtained the bill from Stephens to verify its accuracy. Stephens said he questioned his bill first with Mercy staff members and then tried to fight it in court using Carico’s bill as evidence that he was overcharged. But he has been unsuccessful and the unpaid bills have worried him for months. “I can’t sleep, my work has suffered, my mind goes blank, (it is) hard to make common decisions,” he said in a written statement he shared with the Herald. In December, he took his frustration to the street, protesting Mercy, Centura Health and the medical system in general for about a month at the intersection of U.S. Highway 160 and Three Springs Boulevard. During his personal campaign, patients have pulled over to talk with him about medical expenses and other struggles, and it has proved to him that the U.S. health care system is broken, he said. He said he is specifically concerned that he was billed $741.10 by the hospital and $418 by the independent physician’s group contracted to Mercy for removing the object from his eye. He describes the practice as double billing. “It’s wrong. It’s just so wrong,” he said. Mercy could not provide comment on Stephens’ case because of patient privacy laws, said hospital spokesman David Bruzzese. However, all patients sign a consent form stating they may receive separate bills for facility fees and professional fees before receiving treatment, Bruzzese said in an email to the Herald. It is not an uncommon practice for patients to be billed by the hospital for use of the facility and for the services of the doctor, Frank said. The Center for Improving Value in Health Care reviewed Stephens’ charges, with all identifying information removed from his documents, and found the fees were in line with charges for similar services in Colorado, she said. “All in all, he has a very reasonable bill,” Frank said. In Stephens’ case, an itemized list of his expenses from Mercy totaled $1,482.20, including about $800 for use of the ER and about $260 to remove material from his eye. The $800 fee is the second-lowest fee he could have been charged for using the hospital. The typical charge for removal of an object from the eye at an ER is $590, Frank said. Stephens was also charged $418 by the independent physicians’ group, including $230 for the emergency room visit and $188 for the removal of the material. Physicians’ groups typically charge $150 for removing material from an eye, Frank said. However, if Stephens was a Medicaid patient, it is likely he wouldn’t have owed anything for his bill, she said. Mercy billed Stephens $741.10 for his emergency room care, or half of all the hospital-related expenses he incurred because he does not have insurance. The discount was provided because federal and state legislation requires hospitals to provide financial assistance and charity care to low-income patients in emergency situations, Bruzzese said. Stephens said he also took issue with the hospital’s charges for medications including $186.47 for a topical anesthetic, $83.60 for an antibiotic and $128.78 for six pain pills. Stephens researched the cost of his medications from local pharmacies and found the retail price of the drugs much lower than the charges from Mercy. An estimate from Walmart showed the anesthetic, antibiotic, painkiller and all the other medication available for $84 total, without insurance. Estimates from other pharmacies showed a similar trend. The Center for Improving Value in Health Care has just started collecting data about pharmaceutical costs in hospitals and couldn’t provide comment on those expenses, Frank said. Stephens also asked Mercy to perform an audit of his charges, and no improper charges were found, Stephens said. When the collections company representing Southwest ER Physicians took Stephens to court for nonpayment of his $418 bill, he said he tried to prove to the judge he was double billed for services, but the judge ruled in favor of the collections company. Stephens was ordered to pay $2,191 to cover his doctor’s bill, 8 percent in interest and $1,575 to cover the opposing attorney’s fees, according to court documents. The judgment sent him into a “mini meltdown,” he said. He now plans to fight bills from Mercy and Southwest ER Physicians in small-claims court, although he said he does not expect to win. In the meantime, Stephens said he plans to keep up his public-education campaign to warn residents about the high cost of care and the “out of control” health care system. “I have done my best,” he said. mshinn@durangoherald.comThis story has been updated to clarify the dataset being maintained by the Center for Improving Value in Health Care about pharmaceutical costs in Colorado. The center has information on pharmacy costs dating back to 2009, and it recently started collecting hospital-specific data on pharmacy costs.